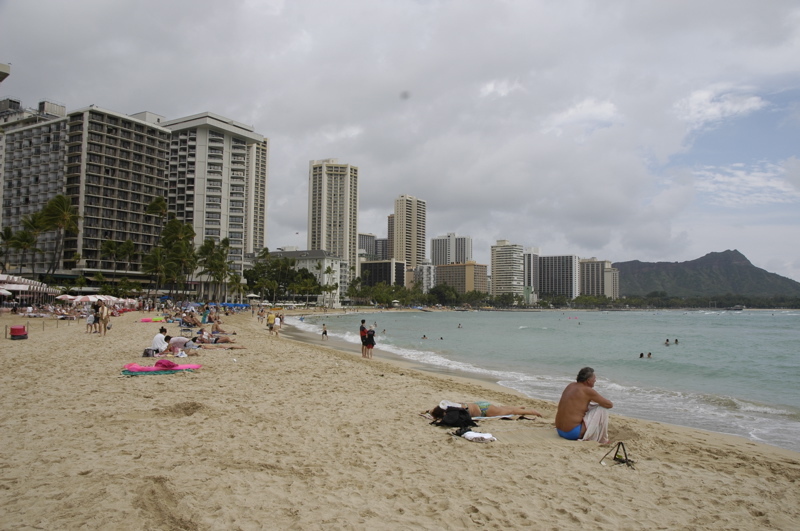 When planning our trip to Oahu we wanted to avoid Waikiki Beach as much as possible. So we only booked three nights here, and we were right to do so. It’s not a bad place but it is so crowded and built-up that it feels like a mix of Miami, New Orleans, and Manhattan. It doesn’t feel like the Hawaii we are used to, probably because we usually seek out the quiet spots, and Waikiki is a traffic-bound tourist trap. Even the beach isn’t that great. It’s busy, and in some places the towering hotels are right up against the ocean with only a tiny strip of sand for the hordes to occupy. Strange, because just a short drive away by car (or bus ride) are some truly spectacular beaches. But if you like to shop, Waikiki is great. The main drag is dominated by malls and knick-knack shops. On the Ewa side are all those hoity-toity brands for people who have more money than they know what to do with, and for the average Joe there’s an ABC Store on every block extending for a mile toward Diamond Head. If you can’t find an ATM, a McDonald’s, an ABC Store, or a sushi place in Waikiki Beach, you’re not looking. There are so many restaurants catering to Japanese tourists here that it feels like we are in Japan at times. Hawaii has had a significant Japanese population since before it was a state, and today it is like an outpost of Japan. Our hotel is Japanese-owned, and all the staff are Japanese. Signs everywhere are bilingual. Our dinners have been udon noodle soups and Bento boxes. It’s fun — we like the food and I like imagining I’m in Japan. Someday we hope to go there for real. Since the weather today was too cloudy for good snorkeling and occasionally too rainy for sightseeing, we spent the day on foot exploring Waikiki Beach and buying a few Christmas gifts for family. But enough of that. We have had too much of the tourist machine already. At one point we hopped a free shuttle bus and found ourselves on a one-way trip to Hilo Hattie’s “flagship store” on the other side of downtown Honolulu. Not only could we not escape, but we spent an hour in purgatory on the bus, trapped in dense Friday afternoon traffic (to go six miles). Once we arrived at Hilo Hattie’s there was just enough time for Eleanor to buy the particular brand of Kona coffee she likes, and hop back on the bus again to fight our way back to Waikiki. There was one bright spot to that adventure. The driver, desperate to avoid the traffic, invented a highly creative route to get us back. This involved driving through a shopping mall parking garage, and at one point, turning down a narrow alley marked “Construction Traffic Only.” As we passed the construction machines in the early evening darkness, an announcement came over the buses P.A. system: “OK … We didn’t go here, and you didn’t see this.” Nope, we didn’t — and we don’t plan to see it again, either. We’ve moved from the leeward side of the island over to the classically tourist downtown of Honolulu, known as Waikiki Beach. Here things are much different, with high-rise hotels and lots of prosperity. The tent cities and depressed areas further west seem very distant. Yesterday afternoon the sun came out again and we went down to Ko Olina, an area of timeshare resorts on the leeward side where four man-made lagoons have been carved out of the wavy seashore. A book I’d read suggested that the lagoons would be good for snorkeling, but they weren’t. That’s what happens when non-snorkelers write tips on snorkeling. Lagoons tend to collect murk, which kills the visibility. Also, since these were man-made, they have sandy bottoms with no reef or rocks, thus they are unattractive to reef fish. We saw a couple of angelfish and that was about it. But the lagoons are wonderful places to swim, even on a wavy day, because they are well sheltered. Emma has been clamoring for more snorkeling so we decided to visit Hanauma Bay State Park a few miles east of Waikiki Beach. 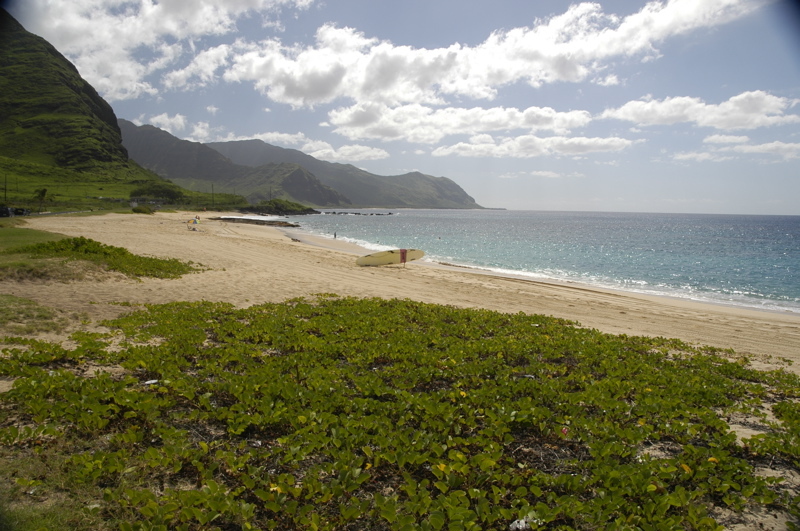 I was expecting an overcrowded beach and more murky conditions caused by clueless swimmers stirring up the sand and stepping on the delicate reef, but Hanauma was a pleasant surprise. 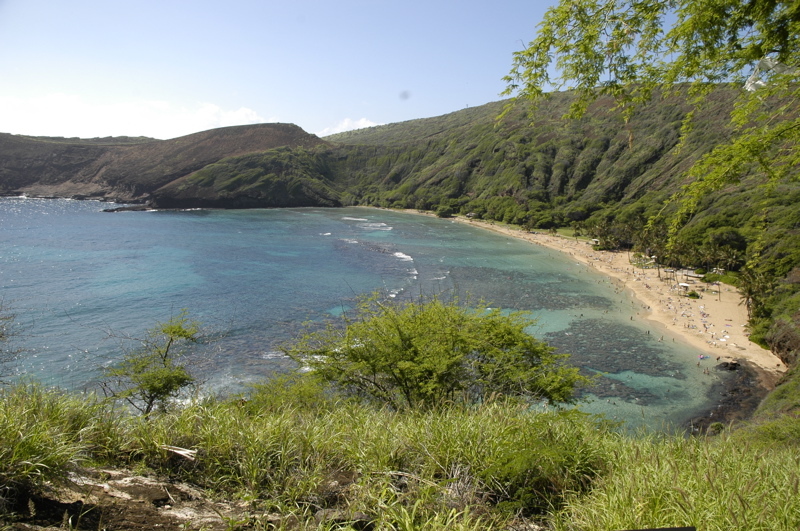 But lately Hanauma Bay been very well cared for by a volunteer group. Now, just to enter the park you must first watch an educational video about how to protect the reef and the sea life. There’s also a very good visitor center with information about the coral, fish, and other sea life. Admission is $5 per person (kids free), and parking is a buck. With all these barriers in place, people seem to really respect the park, and I heard a lot of people talking about the care they were taking to avoid stepping on the living coral, steering clear of the sea turtles, etc. That’s a real contrast to what I have seen around reefs in the Florida Keys. Near the shore the water was predictably murky with perhaps 8-10 feet of visibility. Still, Emma was thrilled to spot a moray eel almost immediately (his mouthful of teeth scared her a little), and numerous colorful reef fish. Visibility improved about 100 feet offshore, and with the educational video still fresh in her mind, Emma was extremely careful not to step down or touch the coral. While she was on the shore resting, I went out past the wave break, maybe 200 yards offshore, and found slightly clearer water and a wider variety of fish. I also spotted a small Green Sea Turtle (called honu by Hawaiians) and watched him eat algae off the coral for a few minutes. Of course Emma couldn’t pass up on this, so I took her out to the deeper water and we spotted another, slightly larger sea turtle. By all accounts, it was a very successful couple of hours of snorkeling. I read a Dave Barry essay once where he described visiting the ocean and not going underwater as being like going to the circus and just watching the outside of the Big Top. It’s true. Under the sea is the real show, full of incredible creatures and tiny dramas. I watched a school of Convict fish swarming coral areas for food, while a solitary little brown fish bravely attacked them one at a time to drive them away from his territory. I watched a moray eel swim slowly in and out of his little cave, baring his menacing teeth. Little yellow tangs swam timidly below me, while a green sea turtle placidly bounced from one coral outcrop to another. There were strange things buried in the sand and deep in coral caves that we only spotted because they moved. And yet from the shore it was just another beautiful Hawaiian beach. We get looks from people because we snorkel in our shorty wetsuits. Nobody else does. Most people don’t bring their own gear, either, preferring to rent it from Snorkel Bob’s or (in this case) right at the beach. So we stand out when we arrive bearing all our stuff, but I don’t mind. Wearing the wetsuits gives added protection against scrapes or possible stings, plus protection against the sun, plus added flotation, plus we can stay in the water much longer. The water is warm enough to snorkel or swim without a wetsuit, certainly. It’s running around 75-80 degrees right now, and even warmer next to the shore. But far out, past the break, I could reach down and find my hand on the cold side of a thermocline, which felt about 10 degrees colder. Very few people other than me ventured out there, and they didn’t stay long. But that’s where we found the sea turtles. Sometimes a little extra effort gets you a big bonus. It’s raining today. No snorkeling. We are taking the opportunity to catch up on some business and personal phone calls. Yes, even in Hawaii on vacation, we keep up with things. And since I’ve got some time, I’m going to share a couple of rants with you. My name is [omitted]. I’m a Casting Producer for ABC’s Primetime show, “Wife Swap.” I hope you don’t mind me contacting you, but we’re gearing up for a fourth season at the moment and we’re currently looking for one-of-a-kind families with plenty of personality! Specifically, we’re looking for the ultimate family of travelers”¦a family that lives and travels the country on wheels! Please feel free to forward this email on to anyone you think would be interested in taking part in this once-in-a-lifetime experience. In case you are unfamiliar with the show, the premise of Wife Swap is to take two different families and have the moms switch places to experience how another family lives. Half of the week, mom lives the life of the family she is staying with. Then she introduces a “rule change” where she implements rules and activities that her family has. It’s a positive experience for people to not only learn but teach about other families and other ways of life. Wife Swap airs on Disney owned ABC television on Mondays at 8 pm- the family hour! Participating in the show is a very unique experience that can be life changing for everyone. In addition, each family that tapes an episode of Wife Swap receives $20,000 as compensation for their time. Anyone who refers a family that appears on our program receives $1000 as a ‘thank you’ from us. First off, let me say we have absolutely no intention of even considering such a thing. Despite the promises, the reality shows I’ve seen have been universally demeaning and about as educational as the Jerry Springer slug-fests. “Wife Swap” is not for us. I’m amazed that people participate in reality TV shows, but they do. In fact, people clamor to be on them. Every time I see someone being humiliated on reality TV, I think, “Hmmm, self-esteem problem.” Why else would they do that to themselves? But hey, if this fits your bill and you want to sell your family for $20k, send me a private message using our contact form and I’ll forward you to the guy who sent me the email. He’ll be happy to collect the $1,000 referral fee. The Act requires banks and other institutions to collect and verify a “physical address” when people do ordinary things like apply for credit cards or open a checking account. If you live in an RV and don’t have a house, what do you do? Simple. You lie. Set up an account with a Private Mailbox firm, or join Escapees and become a legal resident of Livingston TX, or fudge a fake utility bill with Photoshop. There are all kinds of easy ways around this one, and some of them are legal. If everyday people can figure this out, can’t the terrorists too? Of course they can. We can expect that even members of Congress will realize this eventually, and if politically possible, the noose of requirements will tighten. Already it is becoming a problem for law-abiding folks like me. Today I got a call from a large national bank that is processing an application for us. The nice customer service lady wanted to get a physical address, so I gave her our Arizona address. She was able to do something startling: she looked up the public record for the address instantly, and told me that unfortunately the record for our house still showed the prior owner’s name. Thus, for purposes of the Feds, the address of the house we have owned for seven months isn’t good enough. In other words, we are in compliance but still are hassled because of data errors beyond our control. This illustrates how easily the combination of technology and law can work against innocent people more effectively — and in far greater numbers — than it works against malicious people. So I gave her my parent’s address in Vermont. She noted that the first name didn’t match, and we were denied again. Then I gave her the address of some property we sold this summer in Vermont. Of course the public records in Vermont have been updated, so now the current owner’s name is shown and so we struck out again. Finally I dug up a utility bill from the new house and faxed it over to the bank. This satisfied the requirement. But what if I hadn’t owned a house, as was the case last year? We’d be forced to work up a lie. The requirements of the Patriot Act forces large numbers of otherwise law-abiding people to find creative ways to duck the intent of the law. And doubt the real bad guys have fewer qualms about it. If it is that easy to evade, what good is it doing? There’s no doubt that advancing technology and “mission creep” will make it harder in the future for those who don’t fit the Federal government’s preconceptions of how we should live, or whose reality doesn’t match what the database says. Full-time RV’ers are among the first to get caught in this sticky web, but I predict it will get worse if the Patriot Act is allowed to stand. Our quest to understand Hawaii continues. This morning on our drive south the first revelation was that Hawaii’s “homeless problem” is much more vast and complex than we had first thought. 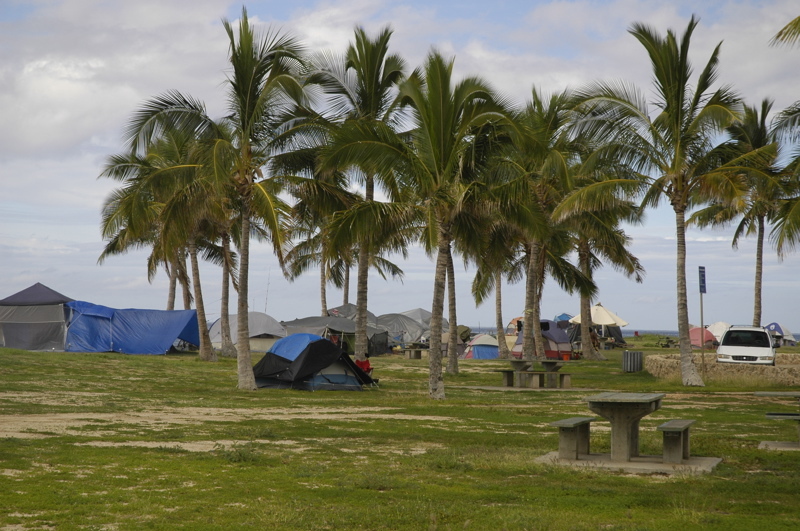 The cities of tents extend for intermittently for about sixteen miles along the leeward Wai’anae shore. Our initial impression was that these were beach bums, drop-outs, and surfers who were only taking advantage of a cheap lifestyle, but upon a closer look it has become clear that families are living there. There are children and old people, people who live in dirty clothes and a few who drive expensive cars. They have taken over miles of beach and half a dozen state parks. There are hundreds of tents and perhaps a couple thousand people — and the number is growing. It is the largest encampment of homeless people we have ever seen in the United States. The western shore of Oahu is a little slice of the third world, right here in our country, just 30 miles from some of the wealthiest people in the world blithely enjoying Waikiki Beach. 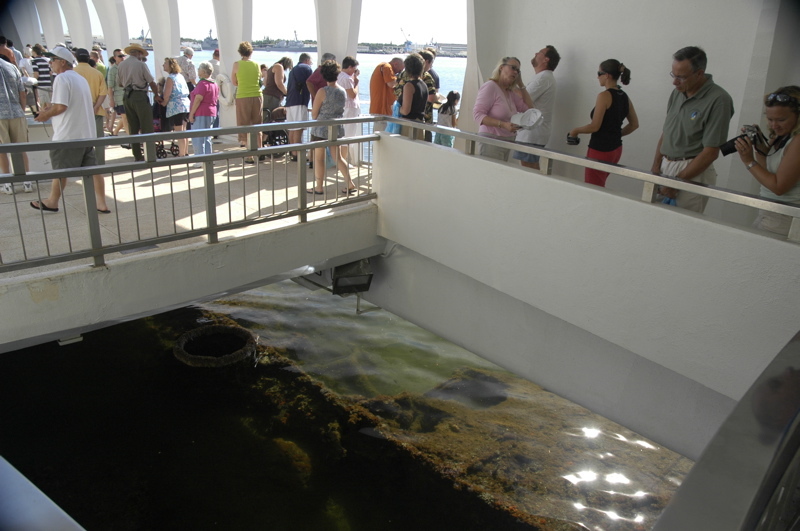 Another angle on Hawaii is found at Pearl Harbor, where the USS Arizona lies on the bottom and WW II history is echoed in the monument, the neighboring Pacific Aviation Museum, the USS Missouri floating nearby, the submarine Bowfin, and a circle of plaques that commemorate the heroics of submariners. The Arizona monument is right up there with the Vietnam Memorial in Washington DC for sheer chilling power combined with historical education. I highly recommend it to all, despite the 1-hour plus waits required to see the monument. (You have to be taken out to the site by Navy launch.) The museum, brochure, and movie all do an excellent job at explaining the events leading up to Pearl Harbor and our involvement in World War II. So by the time you get to the monument, standing solemnly over the gravesite of 900 Navy servicemen, and see the “black tears” of oil floating to the surface from the encrusted wreck of the USS Arizona, it all comes together. 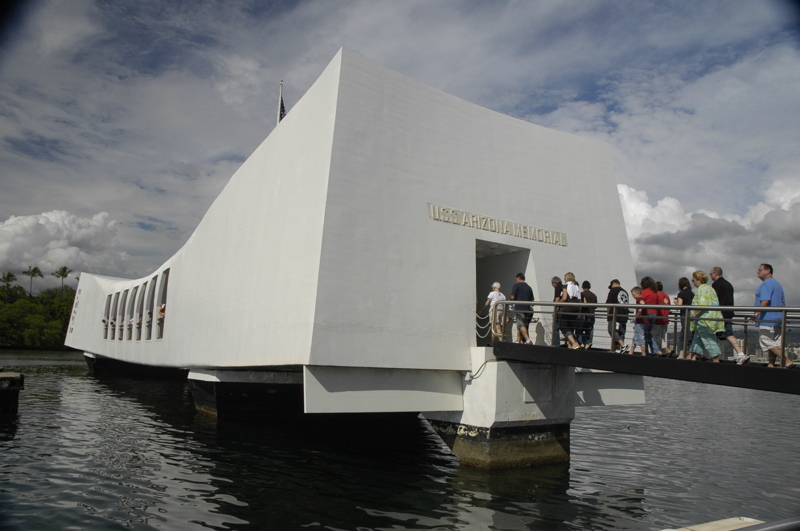 As much as the long-ago volcano that built the island, the events of Pearl Harbor formed the Hawaii we know today. Our final lesson on Hawaii comes from the food. Go to a lu’au and you’ll get some traditional Hawaiian foods like poi, and a lot of other modern favorites like pork ribs. In the fancier restaurants you’ll find “Asian fusion” and “Pacific Rim” cuisine. But today’s Hawaii has a people’s cuisine that the fancy resorts won’t acknowledge. Here on the cheap side of the island there are several “chop suey” restaurants, and in our quest we felt obligated to give them a try. Clearly they are popular with the locals. It turned out to be a good gamble. We ordered a few simple dishes: wonton soup, noodles with shrimp, etc., and were rewarded with an enormous amount of delicious food for dinner in our hotel room. This may be the best deal on the leeward side. Add to the chop suey another Hawaiian favorite: shave ice. On the North Shore in the town of Haleiwa is the best shave ice we’ve ever had. For a buck twenty-five you get a huge cone of ice drenched with three different flavors of sweet syrup. This is not a 7-11 Slurpee or one of those lame “snow cone” things sold on the mainland. This is a really incredible sensation of frozen nectar, and just the right thing for a humid Hawaiian afternoon. Perhaps if we keep ingesting these things we’ll come to understand Hawaii even better. It’s worth a try. At 3:10 a.m. last night a strange dream startled me awake. I noticed that the entry light in the hotel room was left on, so I got up to turn it off and stepped into a puddle of water. Water was dripping from the illuminated ceiling light onto the tile floor. My laptop was sitting on the floor just a few feet from this event, being recharged at the only available plug in the room, and it was splashed with water, but fortunately only on the top. The keyboard and the rest of the case were dry. I rescued it and grabbed the ice bucket to catch the dripping water, and then called the hotel’s Front Desk. By 3:30 or so the Mystery of the Dripping Light Fixture was solved: the central air conditioning unit’s drain had apparently failed and the ceiling above our entryway was flooded. We shut off the A/C, laid out some towels, and went back to bed. That is, until 5 a.m. when Emma awoke us to announce that the front right bicuspid that had been bothering her for the past week had finally come out. Eleanor decided that the tooth fairy was already on her way home for the evening, and it was agreed that the tooth would have to wait for the next night. So it wasn’t a highly restful night. At 8 a.m. we got up and began packing up the room to move to another room. Between packing, waiting for housekeeping to get another room ready, and unpacking, we lost most of the morning. I would like to say that the hotel was exemplary about this situation, but they weren’t. The Front Desk staff was unapologetic and we ended up in an identical room with no offer of an upgrade or any conciliatory action for the wasted morning. But this is not highly surprising. The hotel is tired. Basic maintenance is done but the little signs of long-term decay are everywhere here. The beds are saggy, the drawers are malfunctioning, the carpets are overdue for replacement, the bathroom hot water tap doesn’t reliably shut off, the A/C thermostat doesn’t work, and a couple of fluorescent bulbs never would light fully. On the surface the hotel appears nice enough, with very nice landscaping and a spectacular setting with panoramic views, but at its core it is a grade B tourist hotel with decaying infrastructure. This gave me occasion to compare disappointing places we’ve encountered with the Airstream to this experience. We’ve had some really bad campgrounds, but since we tow our “hotel room” around with us, at least we have control of our immediate surroundings, and since they are mobile we can easily move to a better location as needed. We also maintain our Airstream better than this hotel does its rooms. Since we usually don’t spend much time in a hotel room, it’s not normally something we think about. Today would have been same if we had been able to get up and go out for the day as we were expecting. Only the fact that we were trapped here most of the morning has forced us to look at the room and the hotel more critically, and see the faults of the place. With less than a full day to play with, we opted to do tourist things rather than go for a full day of snorkeling. 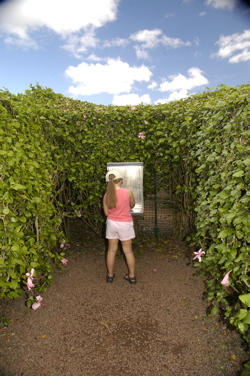 On the way to the North Shore we stopped at the Dole Plantation and ran through the World’s Largest Maze to find eight secret stations. This was undoubtedly Emma’s favorite part of the day, although the pineapple sherbert was probably right up there. The North Shore is a great part of Oahu. It’s known for big surf, especially in winter, but we found a couple of very nice sheltered snorkeling spots too. Right now a big surfing competition is going on, at least on days when the surf is high. 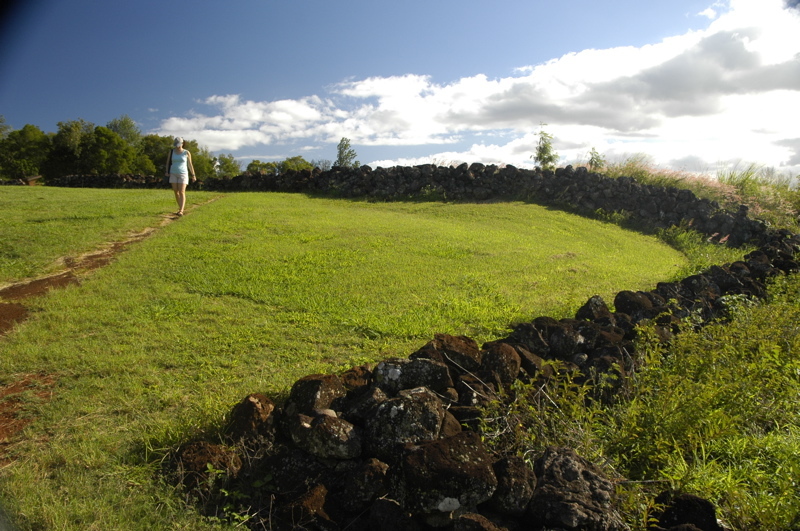 A right turn off the main road leads up a switchback road to the most intact heiau in Hawaii. 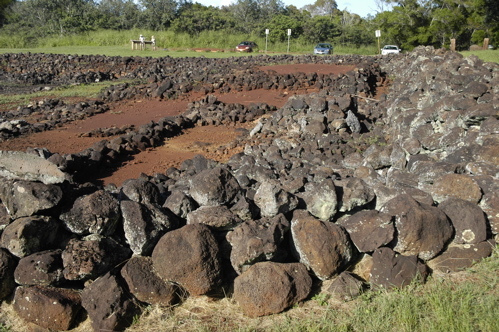 It’s now a state monument, called Pu’u O Mahuka Heiau. 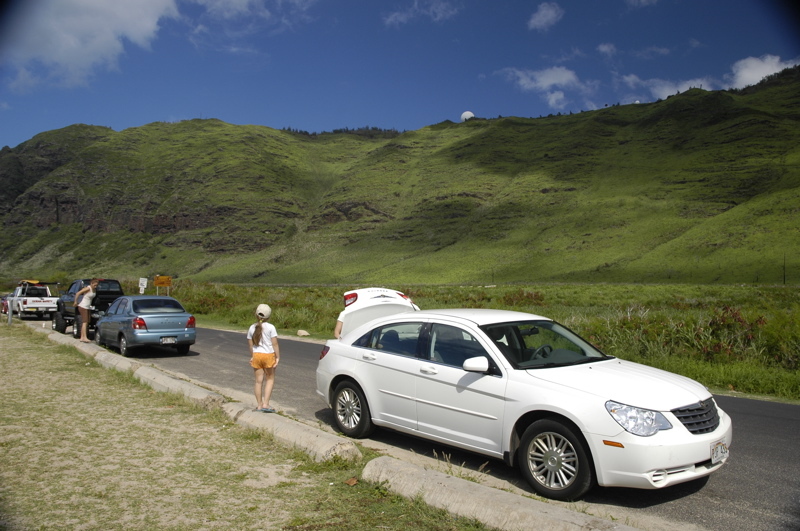 The heiau is a historic and religious site, and you have to treat it with respect. Because the visible site at first appears to be just a bunch of lava rocks in a field, it takes a little imagination to appreciate what this site represents. Imagine in the 1800s, you are a British sailor who has landed at Oahu and is going ashore to find fresh water. You and your fellows are captured by the mu, who hauls you up to the stony heiau to face kahuna (high priest) Ka’opulupulu. As part of a ceremony designed to ensure success in war, you are sacrificed at the luakini altar. Suddenly that pile of rocks is a lot more meaningful, isn’t it? And now, the minor discomforts of a less-than-wonderful hotel aren’t nearly as bothersome. I mean, hey, we’re not being killed here. The rest of the day (roaming through town, checking out beaches, buying flavored shave ice) was fine, but I’ll always remember the heiau. To me, that’s Hawaii. For the next week or so the blog will cover our travels in Hawaii, making it less of an Airstream blog and more about travel in general. But for the aspiring full-time RV’er there’s still relevance. Almost every full-timer I know has broken out of the mold and left the Airstream behind for a period of time, just as you would leave your stationary house behind. There are, sadly, some places Airstreams can’t go. By that they mean that there are no helicopter companies, no parasailing, no museums, no submarines, musicals or dolphin adventures here. All of those things are available in Waikiki and the surrounding area. Here, we have only the basics: wide-open and uncrowded beaches, crystal clear water, snorkeling, hiking, bird songs, and the ruins of a historic site called a heiau. That’s the sort of stuff we came here for, so even though we are on the “tourist resistant” side of the island we should be plenty occupied. Although we can certainly find a lu’au if we want one, about ten miles down the road. And our hotel is not lacking for niceties either. Breakfast on the patio with a view of the mountains and ocean was just as nice as breakfast will be under the awning in the desert parks we plan to visit later this month. 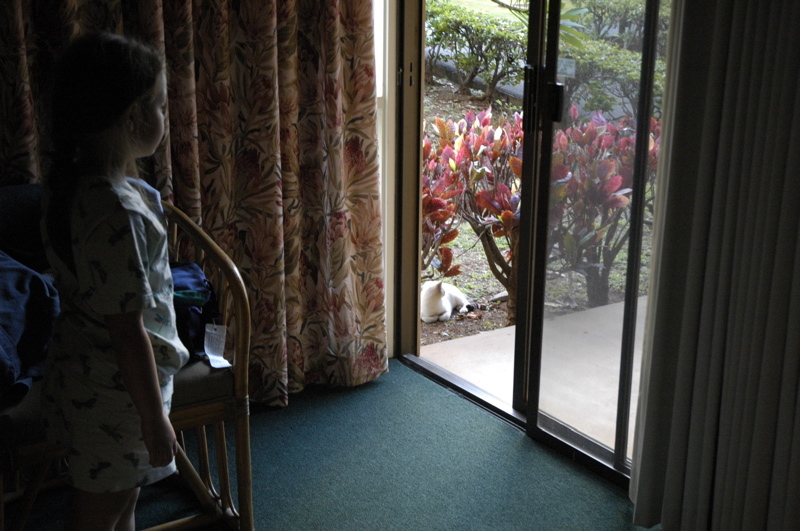 Several times a day we are visited on our lanai by the resident cats of the resort. There are several of them, basically feral but all spayed or neutered by locals who like to see them roaming around. Secret stashes of food around the resort area keep all the cats reasonably plumb. The “fixed” cats are identifiable by a notch on their left ear, and they aren’t too shy about coming into our room for a visit and quick scratch. Today our plan was to find a quiet beach and go snorkeling if the surf wasn’t too high. If you follow the road along northward along the leeward side of the island, eventually you’ll come to the last beach, an Air Force Satellite Tracking station and the end of the road. You can see one of the “golf ball” domes of the satellite tracking station in the photo. Even on a nice Sunday there were fewer than 30 people sharing about half a mile of beach with us. The surf was too high for Eleanor and Emma, but I got a little paddling around and saw some colorful reef fish about 150 feet offshore. It’s beautiful here, but just south of where this photo was shot, along the leeward side of the island, you see a piece of Hawaii that doesn’t appear in the brochures. It is not a wealthy area. For miles along the roadside you can’t help but notice semi-permanent tent cities erected on the sand. These are the homes of itinerant surfers, drop-outs, and some of the poorer elements of Hawaiian society. Some are so poor they don’t even have tents, but live under blue tarps strung from trees. This is a beautiful stretch of shoreline, but most of it is occupied by people who could never afford to live here if they had to buy or rent a house. Seeing the diversity of the population makes it apparent that Hawaii is really not just a paradise. In places it is wild, dangerous, even third-world. We’ve seen these bits of Hawaii before, when visiting the Big Island and Maui. There are even sections of those two islands that the Hawaiians have warned us away from because they are roadless and almost lawless. This might seem frightening and directly opposed to the reason that people come to Hawaii. Most are looking for a resort hotel, some great dinners, a boat ride, a lu’au, a nice beach. Those are all great things but we’re also interested in the real place and the real people. To us, Hawaii is not the equivalent of a cruise ship, but a multi-faceted society with great historical and cultural stories to tell. We’ll be digging into those things a little more this week. 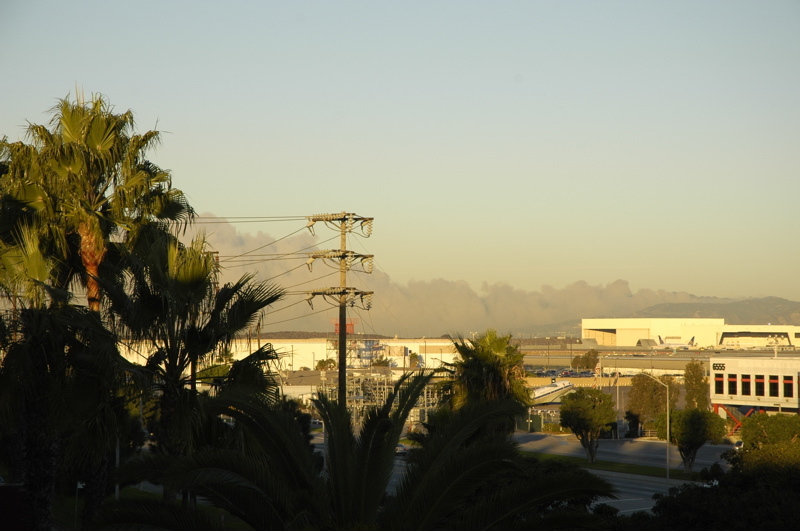 This morning I looked out the balcony of our hotel room and saw a billowing line of smoke moving south along the coastline. Malibu is on fire and the smoke extends past LAX. This made me think of our Airstream, which is parked up in the hills north of Los Angeles. Will a wildfire consume the park while we are gone? I can’t imagine anything worse than coming back from our trip to find it a melted puddle of aluminum. It’s still our primary home at this point. Well, there is nothing I can do about it right now. This morning we could only stare at the news video on the TVs while eating the breakfast buffet at the hotel. With grim images of glowing houses in our heads, we went to the airport. 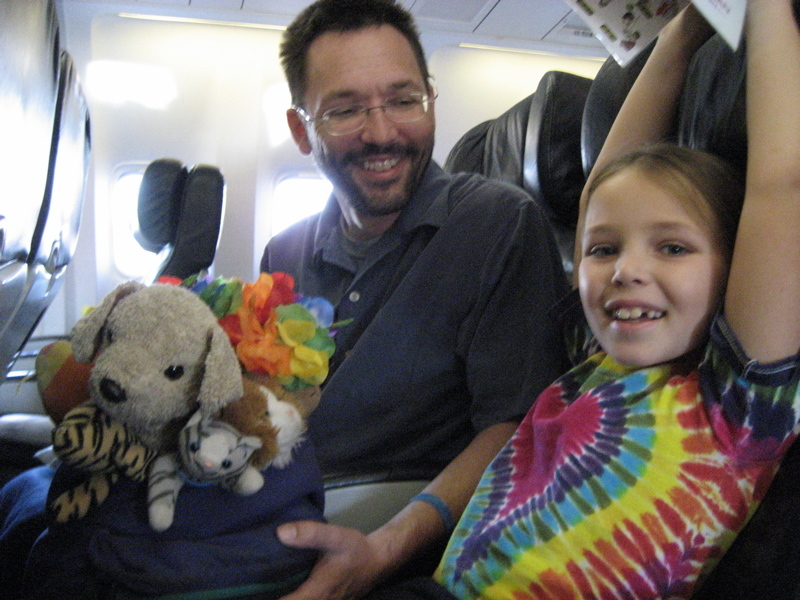 Long-time readers of this blog know that I have no love for commercial airplane travel anymore. I used to travel a lot via air, for business purposes, but now I am happy to have a job that requires me to travel via the surface of the Earth most of the time. Still, once or twice a year I find myself riding the air bus, either for a family visit or for an overseas destination, and it reminds me of the long string of hassles and annoyances that come with air travel these days. The overwhelming feeling I get from air travel today is crowdedness. You have to abandon any sense of personal space from the moment you arrive at the airport. This is particularly upsetting to the RV’er I think because we are accustomed to privacy on demand, and a huge amount of freedom in our travels. “¦ which is where I am at this writing. 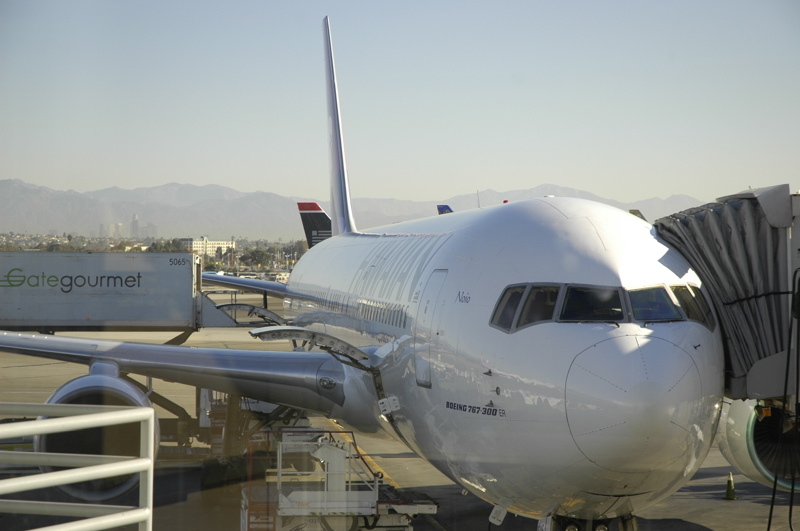 The “ER” designator means “Extended Range”, and it’s the version that is favored by long-haul carriers for overseas flights. Two big jet engines and an extra-long fuselage means Hawaiian Airlines can cart a whole herd of tourists over the Pacific in complete safety and moderate comfort, albeit with only a few cubic inches of personal space. Not that I have anything against the Boeing. It’s a remarkable piece of technology and my immense respect for what it represents as an achievement helps temper my feelings about riding inside it. Just seeing the smooth fuselage gives me an awestruck feeling. I can’t help think about where it has been. Yesterday perhaps one of the jets might have been in Paris, this morning parked at Dallas, and in ten hours it might go back to Europe. The one we are huddled inside at the moment is hurtling at about 500 MPH back to home base, Honolulu. So now you know where we will be for a while. From observing the other passengers on the plane, I see two common responses to the lack of space in a jet airliner. Most people withdraw like a turtle and try not to notice the outside world, even when the guy who bought four gin bottles from the flight attendant is now lurching around inches from their lunch. Sitting in seat 44G and trying to read a book I have a wide range of body parts thrust into my little space, including a variety of buttocks, the occasional hip, and a pair of orange-striped breasts. I really could have lived without any of those intimate presentations. My sandal-clad foot, when it wanders an inch over the little dividing line that separates my space from the aisle, has narrowly avoiding being stepped on several times. Like other people in the “turtle” category, I have been pretending those things didn’t happen. The other major response is to redefine the boundaries of the aircraft and simply take over as much space as one wants. This is akin to sharing a bed and hogging the blankets; it works great for the hogger and not so great for the bedmate. We are surrounded by “hogs” here in the cheap seats, and frankly they are having a better time. They lean over the aisle to shout boisterously to their new friends. They grab the backs of seats as they walk with total oblivion, and laugh loudly to each other. They stand in the aisles until the flight attendants ask them for the third time to please sit down. Their personal space is pretty much all of Rows 43 through 45, plus the aisle between G and H, plus the back kitchen when the crew is not serving meals. The turtles around them are cowering. On a long flight, the airplane forms a sort of community, much like living in an apartment building. There’s the hog couple in 43J/H: she talks so loudly that I pity her neighbors, he’s constantly befuddled but eager to let his traveling companions use his Hawaiian Airlines VISA card for their drinks and movie rentals because he gets points. Together they are a sideshow that is occasionally worth watching. The turtle family in 41 is just trying to survive the trip with two small children, one of whom periodically shouts something unintelligible to all of the coach section. The baby behind us in 45G starts to cry sympathetically when the baby in 41 does, so we get stereo crying every 20-30 minutes. When the movie ended, the airline began playing scorchingly loud Hawaiian music over the public speakers which didn’t improve anyone’s mood and woke up all the babies. Still, at the end of the day there is a nice reward. We’re in Hawaii now, and it is beautiful as always, and ahead of us lies a promising range of possibilities. The plane ride will be worth it in the long run. We have no worries except for the slim prospect of our Airstream being burned in a wildfire while we are gone, but I’ll try to concentrate on the snorkeling instead.